ABRA (Autobiciclette Brevetta Rodolfi Alfeo) was started by Alfeo Rodolfi and based in Bologna. This was an Italian motorcycle brand was mostly known for its motorcycles, but also made a tricycle. 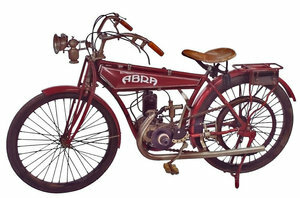 From 1923 to 1927 a limited edition 125 cc and 149 cc bikes with two-stroke DKW engine blocks were built and later added a 132 cc model.